ADP report: What makes 2,500 people across Europe go to work? Why do you go to work each day? The thought of spending the day with people you like and appreciate? The drive to continue growing and moving forward professionally? Or is it the promise of payday that keeps you coming back? Our different motivations for work help make our workplaces the diverse, interesting places they are. But for HR and anyone involved with employee engagement, figuring out what makes people tick presents a complex challenge. 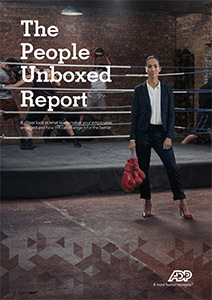 The ADP People Unboxed report gathers data from 2,500 people across Europe. The results provide powerful insights into the ups and downs, inspirations and disappointments of our daily working lives. Download the report now to explore the results and discover how well-aligned HR and payroll operations can boost employee engagement and productivity.